1. Trade fears subside: Stocks moved higher on Tuesday as worries over a global trade war diminished. Investors had been nervous about new steel tariffs -- and supercharged trade rhetoric -- that have come out of the Trump administration in recent days. On Monday, House Speaker Paul Ryan and other top Republicans broke with the White House, saying they were worried about the economic consequences of the trade actions. 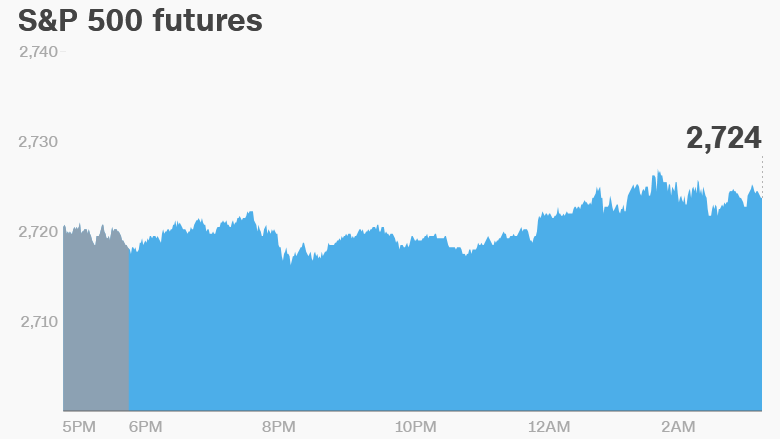 US stock futures were higher ahead of the open. European markets rose in early trading, with some indexes adding more than 1%. Most Asian markets ended the day with gains of 1% to 2%. The Dow Jones industrial average, S&P 500 and Nasdaq all increased between 1% and 1.4% on Monday. 2. Geneva Motor Show revs up: Automakers are descending on Geneva for one of the biggest auto shows of the year. The event could be overshadowed by talk about how US steel tariffs and retaliatory trade moves would impact automakers. Goldman Sachs estimates that President Donald Trump's steel tariff could cost Ford (F) and General Motors (GM) $1 billion a year. Trump has also threatened to hit cars made in Europe with a new tax. 3. What to watch -- Nordstrom, Saudi Aramco: Shares in Nordstrom (JWN) could be on the move after the retail giant rejected a takeover offer from the Nordstrom family. The family's offer of $50 per share was "inadequate," the company said in a statement. The CEO of Saudi Aramco will speak at an energy conference in Houston at 9:50 a.m. ET. The Saudi Arabian oil company is looking to list a small portion of its shares on stock markets this year. Global exchanges are competing to land the massive listing. 4. Earnings: Cars.com (CARS) and Target (TGT) will publish earnings before the open. H&R Block (HRB) and Urban Outfitters will follow after the close. Lego released annual results that showed a 8% decline in revenue for 2017.